Another fine day was forecast so we opted for another day on the bikes.We started by taking the same route to Calmari we had taken with Martin the week before. We even diverted to the cafe in Moscari for a mid morning coffee and slice of cake. It was only after Calmari we deviated from the route. This time we turned right and joined the steady stream of cyclists climbing the 7.9 km of the Col de as Batalla. 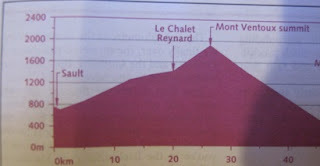 The climb is quite gentle and averages 5.6%. A problem with the camera battery meant Lyn did not have an excuse to stop and take photos. The km's of the climb were slowly ticked off and finally we were at the petrol station and cafe to the top of the pass. We did not stop and instead had a short fast descent to the monastery at Lluc were we purchased 2 expensive coffees and pie with peas for a late lunch. It was then a short climb back to the main road and after some long downhill sections a short climb to the top of the Col de Femenia. 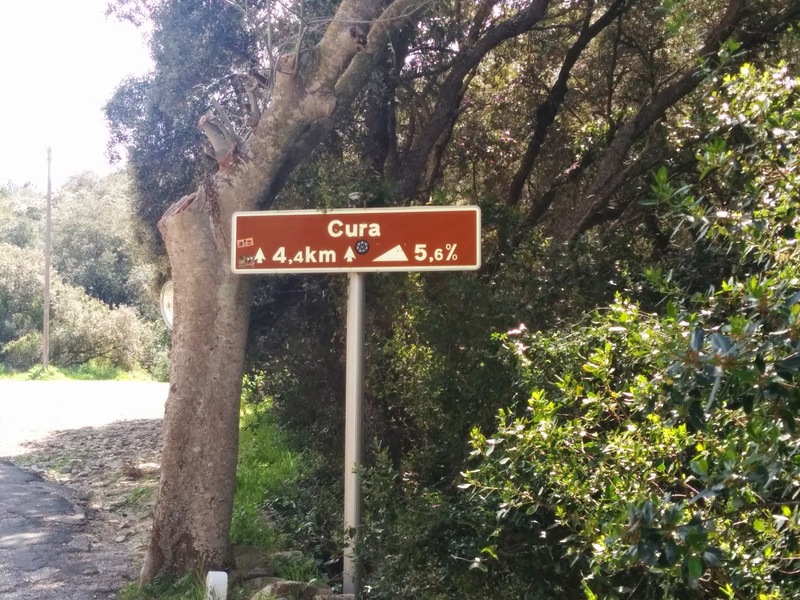 It was then downhill all the way to Pollenca. A fast descent at first but the gradient become more shallow for the last 6km into the town. 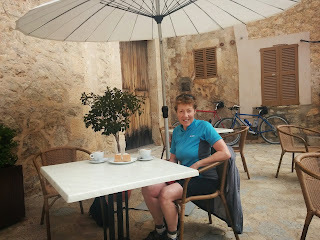 The ride could be tackled in either direction but the advantage of returning via Pollenca is you can stop for an ice cream from the stall on the main square. Flavours were finally selected from their abundant range and once eaten we turned to Puerto de Pollenca via the Cami de Llenaire. Around trips of about 45 miles. We were back at by the apartment in time to sit by the pool and enjoy the sunshine. After a group photo by the pool we said goodbye to Martin and Sue. Whilst they headed for the airport we set off a little later in the van for Algaida. Today's ride was on the back roads from Algaida to Llucmajor then on to the small port of s'Estanyol de Mijorn. We have had a couple of meals in the Restaurants Es Mollet on previous trips to the Island and Es Mollet is an excellent place for lunch. We stopped first in the square at Llucmajor and whilst we enjoyed our cafe con leche sympathised with Martin and Sue who arrived at the airport to find because of problems with French Air traffic control their flight had not left Manchester. 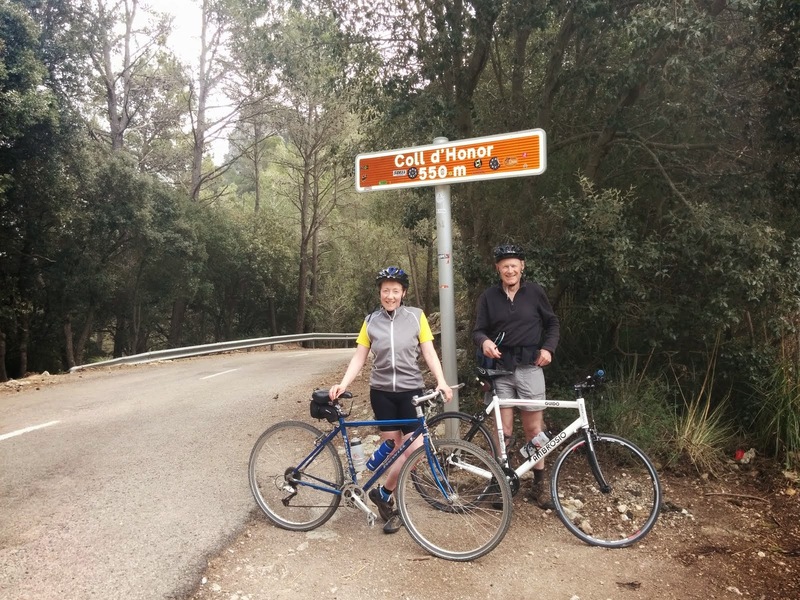 It was then about 18 miles to the s'Estanyol de Migiorn. We arrived at 2:00pm.The restaurant was open and servings food until 4:00pm but had become more popular so we had to sit inside. We had an excellent value tasty 3 course meal with a bottle of wine for 10 Euros pp.The wine was not finished as we still had 22 miles to cycle back. We returned to Llucmajor on the Cami de son Muro. No signs of tortoises this year. We were to full from lunch to stop for an ice cream so continued back to Algaida. We made the mistake of following the signs to the centre as they took you twisting and turning around lots of minor roads and then stopped. After a couple if wrong turns we found the centre and then located the van. As we were driving back we had the message Martin and Sue had just landed in Manchester .No prizes for guessing who had the better day. We had clear sky's all day with a high of around 18 degrees. We eventually found a spot to park the van in Costitx on a wide road in a very quite residential area.We took the minor track towards Sencelles but took a wrong turn and ended up on the Ma 3120. We took this roads towards Sencelles and the minor track to Santa Eugenia. It was then the gentle climb to Aloro. On reaching the square we headed for "ecosenalla" vegitarian restaurant cafe and shop we went to last year. There was no menu advertising food, we asked and they were doing a set lunch menu. We had an excellent 3 course set menu, bread and homemade hummus for nibbles, carrot soup and tofu tortilla to start followed by a homemade vegetarian patty with spicy tomato source and potatoes. We shared a desert of apple flan and had a digestive yogurt. We finished with coffee. Excellent value at 24 euro including a drink with the meal.It a real find and the mystery is why he does not try and at attack more of the cyclists who cycled past the shop when visiting the town. After lunch we continued to Llorsta then Binissslem crossed the Ma 13 and took the Cami del Muro to Binial. This time we had not parked at the roundabout so continued via the mountain bike track to Costitx. Around trip of 40 miles. A good ride with views of the mountains. We returned to Port de Pollenca via Lidl in Inca arriving back at around 18:15pm. We eat in the apartment and had a very tasty 3 courses , deep fried mini peppers and Allioli, chicken stew and caramelised oranges. We parked in our usual spot at the start of the mountain bike track. The bikes were reassembled and Lyn and I see off down the track and at the end of it turned towards Pina. We needed to be bsck at a reasonable time so planned a route that could be extended. Martin returned his bike the previous evening and was off on a walk with Sue. After Pina we went to Algaida and then took the pretty back road and cycle path to Llucmajor. In Llucmajor we turned towards Randa on the Ma 5010. There is a cycle routethats marked on the map starting in Llucmajor but we avoided it because it included a climb a 9%. It was about 5km on the main road before the turnoff and it included a couple of long climbs. After breakfast Martin visited Bruce to collected his hire bike. He asked for the "***ist" bike in the shop but ended up with a smart hybrid but with racing tyres.Sue went walking and Martins bike was packed in the van for a ride from Ariany. The route was one we had done last year and went via Petra to the Bosch valley. 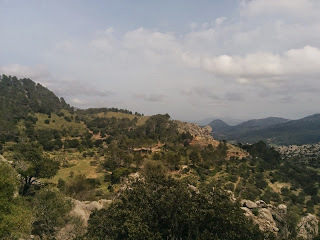 Across to Sant Llorenc des Cardassar then to Manacor via the back roads. We wanted to be back in a reasonable time so them followed the cycle path alongside the motorway before cutting back to Petra and Ariany. The sun shone all day with temperatures in the hi teens. The bakery in San Llorenc was opened when we arrived. We were not shown their oven this year but the locals were arriving with trays of pies and Easter pastry's to bake. We shared a couple of wholemeal vegitarian pies and a meat pie with cheese followed by a sweet cheese pastry. ,After lunch we had had trouble finding the right road out of the village again but after a couple of detours eventually found ourselves on the Ma 4022. This year we took the minor track that cut the corner and got us off the main road. About 3km from Manacor we crossed a velo vert that opened in 2014 and runs for 29km along a former railway line from Manacor to Arte. We cycled the short section to Manacor and will do the rest of it this holiday..
We arrived back at 5:45 and had time for a shower been heading to Polleca for a meal and to see the Easter procession down the Calvari steeps. It was schedule to start at 9:00 but was nearly 10:00pm before the parade reached where we were standing on the steps. Binali.We had a few spots of rain ,dark threataning clouds and strong winds on the descent from Alaro.However the rain stayed away and Lyn and Martin's cunning plan of sending Robert to get the van was not required. An excellent ride of between 35 ,42 or 46 miles! We awoke to clear sky's but it was cool. After some deliberation the correct tops were selected. Robert wore a gillet and Lyn had both a gillet and windproof top. Martin was in his Marks and Spencer's fleece. We took the back roads to Campanet . The fate at the church Sant Miquel was just setting up. The cakes we just being put out but we were still full from breakfast so where not tempted. It was then the long way to Moscsri where stopped for coffee at the bar near the church. We then backtracked towards Bonibona continuing to Calamari, Manor de la Vall and then downhill to Bimimar. We stopped last year at the bar Mallorca and planned to stop again. After a little joke from the proprietor about having no menus we all selected a mixed Pa amb oli washed down with a small beer from the carte. 3 very generous plates of food arrived which we all said was to much and was enough to shsred. However we managed to finish it. The route after lunch had not been preplanned and rather than returning via Moscari we opted to continue to Inca via Lloseta and the take water lane to Sa Pobla.. Martin joined a team of cyclists complete with team car with flashing lights on the road out of Sa Pobla to the Parc natural de S'Albufera and had fast and easy couple of kms. Robert followed a couple of cars behind. 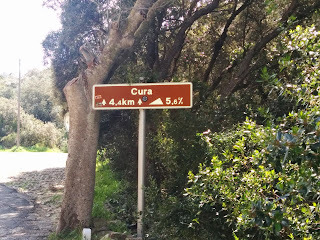 After the parc it was the back roads to Port de Pollenca. Around trip of 52miles if you include going back to get Lyn another top. It was warm in the sunshine with a maximum temperature of around 17 degrees but with a cooling breeze.